Expedition 41 Commander Max Suraev of the Russian Federal Space Agency (Roscosmos), NASA Flight Engineer Reid Wiseman and Flight Engineer Alexander Gerst of the European Space Agency landed safely on the steppe of Kazakhstan near the town of Arkalyk on Nov. 10, Kazakh time, after bidding farewell to the Expedition 42 crew members and undocking their Soyuz TMA-13M spacecraft from the Rassvet module on the International Space Station. 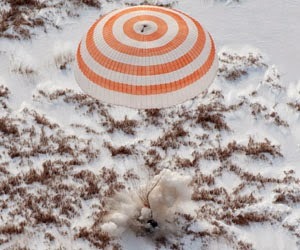 ISS commander, Russia's Max Suraev, his American colleague Reid Wiseman and German Alexander Gerst from the European Space Agency (ESA) touched down at 10:58 pm Sunday (0358 GMT Monday). The three men smiled broadly from reclining chairs as medical personnel tended to them amid patches of snow on the barren steppe just northeast of Arkalyk, Kazakhstan, where they landed. 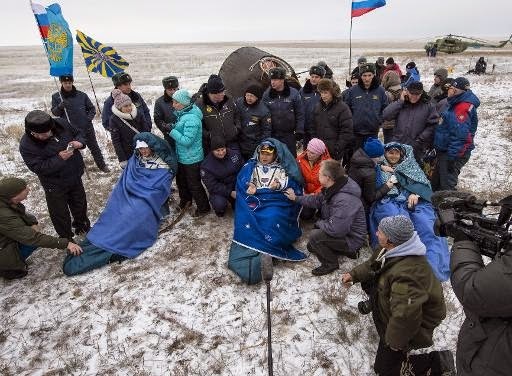 Surayev flashed a V for victory sign while Wiseman pumped his fist as they waited to regain their land legs after nearly half a year of weightlessness. "Everything was in the spirit of cooperation, so I think that everybody needs to learn and follow the example of the ISS crew members," Surayev said. "Let's try to live together side by side. This is the most important thing," he added. While in space the crew traveled more than 70 million miles (112.7 million kilometers), NASA said. The "bulls-eye" touchdown was executed amid low clouds and fog "following a flawless descent back into the atmosphere," according to NASA TV. The spacecraft was pulled onto its side by its parachute upon arrival, which NASA TV added was not uncommon. The US space agency said the "departure of Wiseman, Gerst and Surayev marks the end of Expedition 41," referring to their mission to the ISS to carry out equipment repairs, maintenance and experiments. Surayev was on his second long ISS mission, having now spent a total of 334 days in space, while the other two astronauts were on their first trip. The three men were pictured smiling and with their arms around each other before hitching the ride back home, undocking from ISS at 7:31 pm (0031 GMT). Another three-person crew remains on the ISS to "continue research and maintenance aboard the station" and will be joined by three more astronauts who launch from Kazakhstan on November 23, NASA said. The US space agency has helped fund private companies in a push to restore US access to the ISS. In the meantime, the world's astronauts must rely on Russia's Soyuz spacecraft to get to the ISS and back, at a cost of $70 million per seat. There are 15 country participants in the ISS program, though the US and Russia contribute the lion's share of funds for the project.